After the morning at the ruins, we had lunch, relaxed for an hour, and then went to Cenote Zacil-Ha. Cenotes are basically giant limestone sinkholes with incredibly clean, clear fresh water. 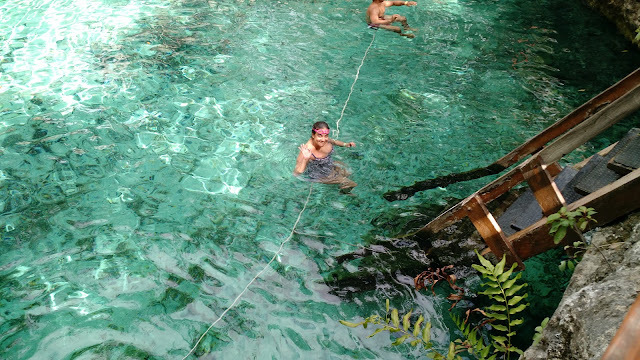 You can usually swim or dive in a cenote, often after paying admission, and there are over 4,000 all around the Yucatan. Our host had told us to check out Cenote Tortuga (one of the few free ones), but Google is not the best in the Yucatan and sent us down this windy, unpaved, dusty road for 15 minutes that ended up nowhere. We eventually asked some of the people who lived out in the "bush" off this "road", but they kinda pointed and told us to go in the other direction. 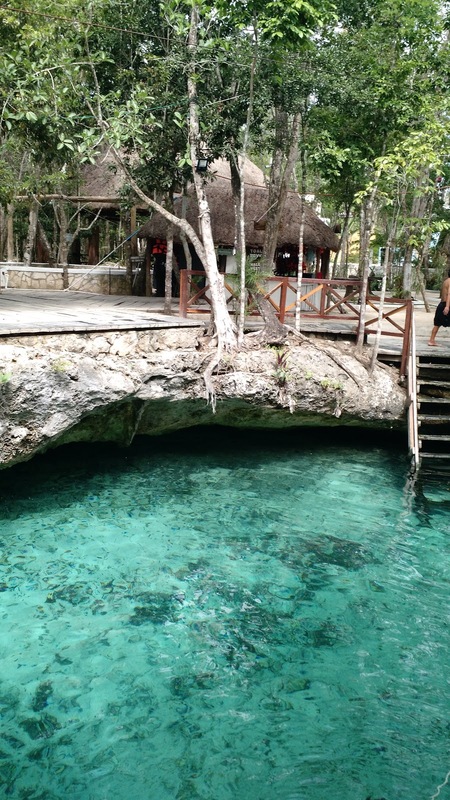 Adam had read that Cenote Zacil-Ha was nearby and known for its great water color, so we went for that instead. Thanks to these guys for helping us navigate the cenote scene. We should have paid more attention to directions to Tortuga! Zacil-Has is a relatively (in cenote terms) built up cenote. There was ample parking, signs explaining how it works and pricing, showers (mandatory before jumping into this water, it doesn't really have anywhere to drain to... kind of), a pool, bathrooms, a small bar, life guards, palapas, life jacket rentals, and even some lodging on the premises. One of the jumps and ladders. Amazing water color. It was beautiful! You need to rinse off before you jump in so the water stays pretty pure. The water was mostly under tree cover, so it wasn't warm like in the Caribbean. It took me a good 15 minutes to jump into the hole (I jumped from the 1.5 meter platform; the other ones were a bit higher), but it was really refreshing once I sucked it up and jumped in. The other thing about cenotes is that a lot of them are connected by a network of underground rivers. I don't think much of this is explored at all, but Zacil-Ha definitely connects to something. Around the edges of the cenote, if you dive down just a bit, the water continued much deeper and way beyond the small circular border on ground level. As we were getting in, some divers came up from that area with lights and extra tanks. 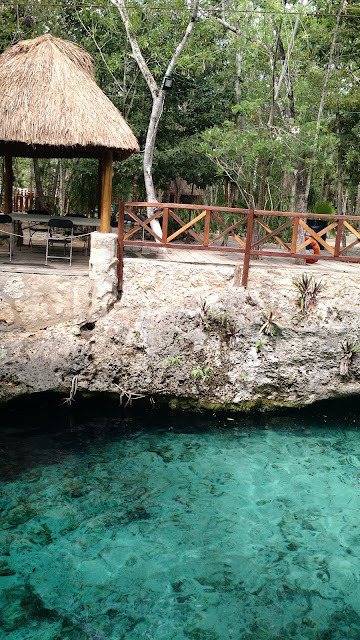 As we had just arrived there, we assumed that they went down from this cenote and explored the caverns below it. However, a few hours later, after no one had gone down again in this cenote, two more divers came up! We didn't talk to them but as divers we know that it's very unlikely that these divers started before we got there, so we're of the opinion that they started in a cenote down the road, navigated the underground rivers and surfaced in our cenote. Adam spent A LOT of time exploring while I just relaxed. The cenote wasn't big, but it's beautiful and was pretty empty until the tour buses (THREE OF THEM!) all showed up and the place got packed. Thankfully, we had been there for a few hours already, so we decided to leave and head back to town. The cost for cenote admission was $60 MXN each (free parking) and nothing else was mandatory, no guides or safety gear. Adam did one zipline jump for $10 MXN, and we did see a lot of people rent life jackets. Overall, this cenote was great for jumping and hanging out, but the real magic was at the edges if you had a pair of goggles to explore a bit. Adam got a ton of GoPro footage swimming in the cenote and exploring the edge caverns. So much so that it's going to take forever to upload it all over hostel and Airbnb wifis. We'll post some kind of video from that when it's all sorted out. We didn't take many cell phone pictures because we got so much on the GoPro, so this post will be a little visually underwhelming until that happens. It was! So clear, so peaceful. I'm really happy that we got a few hours there before the massive groups showed up - advantage to having a car for the week. We're trying to decide if we should rent a car for a day here in Merida and go check out some ones around here. There are thousands in the Yucatan peninsula!